Finding yourself stranded at Mumbai airport at 1am – having discovered that the taxi and hotel room you booked are no longer available to you – is not the most auspicious way to start a solo trip around the south of India. A fat, nicotine-coloured moon made little impact on a fog-strewn night as I stood, pale and sweating, in the car park with a look of “what now?” on my face. All guide books, locals and airport staff will advise you not to get a taxi that you haven’t booked, and certainly not taken to an unknown hotel in the centre of the city’s Northern district without someone knowing where you’re going. Which was, of course, exactly what I did. While my taxi driver enquired after my boyfriend (and I hastily made up a false engagement and a Thor-like countenance), he weaved the car through impossibly narrow streets past the slums that circle the runways. It was a truly filmic sight, with stray dogs slinking around piles of garbage and men hauling Hindu icons from a covered van into a darkened building. Eventually we reached the rather grandly named JK Regency Hotel, though I soon discovered the only lordly aspect was the price. My room was above the restaurant and imbibed with an aroma of old cooking oil, the sheets displayed evidence of previous guests and the bathroom hosted a family of mosquitos under a dripping, broken shower head. In such surroundings it wasn’t hard to make an early start to the day, though not – of course – without breakfast. 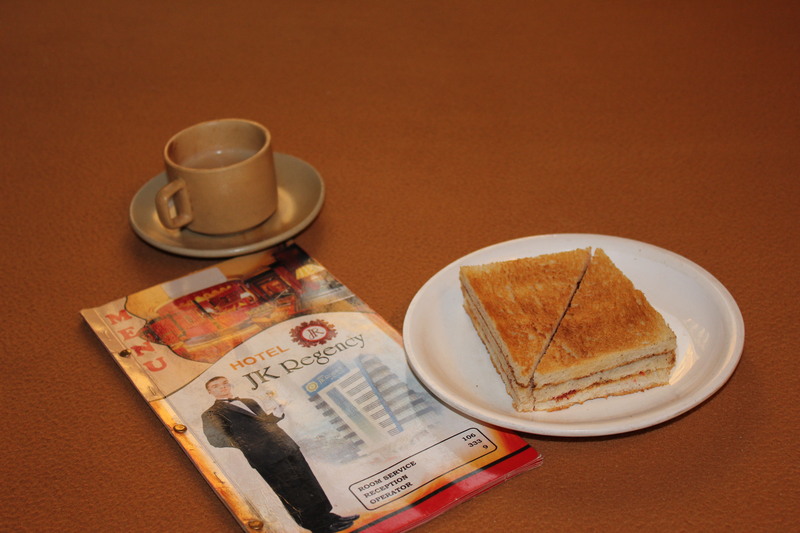 Wary of being too adventurous I ordered toast with jam and a masala tea. Which was, in fairness, what I got. The tea was hot but peppered with floating miscellany, and in a feat of culinary genius the toast was solid and dry with a distinctive methane after taste. An inauspicious start indeed, but one that would make me very grateful for the culinary delights that were to come. Price: too much. Breakfast not included (or recommended).